Best ChapStick Ever? It’s Hard to Beat Cupcake Flavors! Best ChapStick ever. A sweet, simple indulgence! You know how as a mom you have to grab the peace and quiet when you can get it? Or sit just a bit longer in the car (ahem, mini van) while the kids are strapped down so that you can check your email or send a text without someone yanking at your arm? Yoga sessions look a little like this, and you’re forced to take showers during naps or go to the bathroom when the kids are safely occupied so you can have a little privacy? It’s definitely the little things, the little indulgences and moments of peace that can go a long way in keeping you sane. 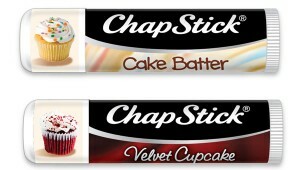 That’s why I love the limited-edition cupcake-flavored lip balm from ChapStick. They’re little sticks of balmy goodness that feel special. Sure, standard cherry and original or even the Sporty Lemon are fine, but these versions are truly yummy and the best ChapStick I’ve ever tried. With Cake Batter and Velvet Cupcake flavors, these make a fun way to get a calorie-free cupcake fix. (Not that we are opposed to cupcakes! Moderation, folks!) They smell seriously delicious, and while I was a fan of the Cake Batter version (I’m a sucker for cake batter and cookie dough), my husband wanted to eat the Velvet Cupcake version. Either way, you seriously can’t lose. They smell so yummy and, of course, live up to the typical ChapStick quality and will keep your smoocher kissable. The ChapStick® product, information and gift have been provided by Pfizer Consumer Healthcare. All thoughts on the product are, as always, FBM’s own! I’m not sure which I’m more excited about – the cake batter, or the fact that I just discovered Sporty Lemon exists? I’ve never seen that one!